The Ronstan Quick-Lock™ is the quickest and most user friendly winch handle available for racing and cruising sailors alike. In addition to its super fast grab-and-release mechanism for foolproof single handed removal, it is the only handle to feature the patented auto quick-locking mechanism that lets you put the handle in the winch without depressing a lever or rotating a knob ï¿½ it couldnï¿½t be easier! Ronstan Quick-Lock™ allows you to immediately place the drive head into the winch socket, without the need to rotate a knob or depress a button. Its stainless steel locking lever then retains the handle securely in place until you are ready to remove it. The large easy to locate release button extends up the length of the handle providing fool-proof grab-and-release operation. This makes the Quick-Lockï¿½ ideal for operation at full extension and with only one hand. Its intuitive nature makes it ideal for use by inexperienced and experienced crew alike. A precision ball bearing race in the hand grip provides free rotation for high speed or high power cranking alike and the refined ergonomics ensure efficient transfer of effort. 8ï¿½ models cater to situations with restricted space and 10ï¿½ handles provide greater mechanical advantage - the basis on which winch power ratios are calculated. 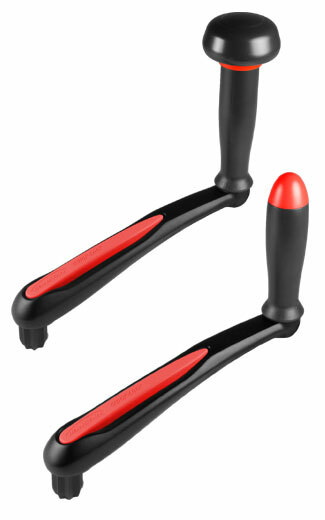 Palm grip handles are the ultimate option where serious two-handed cranking is required.